I thought that it was time for a bit of Melbourne-related cafe inspiration today and in particular, cafes that are great for 20-somethings. I know that there’s nothing more that my generation loves than spending all of our money eating and drinking but we’re very picky about where we go. It goes without saying that Melbourne with its endlessly growing choice of cafes, is a fantastic city to be a 20-something in, however with so many great cafes to choose from, it can be exhausting trying to choose where to go- especially before you’ve got that coffee in you system, right? To help you out I’ve put together this list of my favourite cafes for 20-somethings in Melbourne’s CBD. These are cafes serving great coffee and food, with chilled staff, space to sit and work and most importantly, these are cafes that don’t feel imposing to go in to. Vacation is a really chilled, spacious and welcoming cafe in the heart of Melbourne’s CBD. It’s contemporary and bright decor makes it seem like it would be more suited at the beach than in the heart of the hustle and bustle of the city: hence the name I’m guessing. Mr Tulk is probably my favourite cafe in Melbourne and it’s quickly becoming one of my regular haunts. This bustling cafe is located right next to the beautiful State Library (a place that everyone visiting Melbourne needs to check out) and its location, plus the fact it was named after the library’s first chief librarian, has transformed the cafe into a student hangout and an ideal place to work or study. If you’re after food then their house -made banana special is award winning- Just saying. Brother Baba Budan is one Instagrammable Melbourne cafe for sure. This tiny cafe is tucked away on Little Bourke Street and has a really quirky decor with loads of chairs hanging off the ceiling. The baristas are super chilled and the coffee is fantastic. It definitely wins the cool for me. You know how I said that us 20 -somethings are picky when it comes to cafes, well you can rest assured that Duke’s really is one of the best in Melbourne. This well established cafe is really popular and it’s best to get there really early if you want to bag a table. Even if you do have a wait though, it’s worth it for a fantastic cup of their own roasted coffee and their huge cake and pastry selection. Great vegan options available. Journal cafe is about as Melbournian a cafe as you can get so it’s great if you want to feel just like a local. Journal is located in the city centre on bustling Flinders Lane in the same building as the City Library. It’s the ideal place to grab a bite to eat and a cup of coffee in the morning. The upstairs canteen is the best place to people watch from as its window seats overlook the crowds wandering through the busy Centre Place laneway. I love Tulip Coffee so much. It’s a really tiny little place located on Delgraves Street right opposite Flinders Station and it’s absolutely gorgeous. The staffs are always welcoming, the atmosphere is always calm and the whole place is pink so it’s another place that is good for your Insta’s. 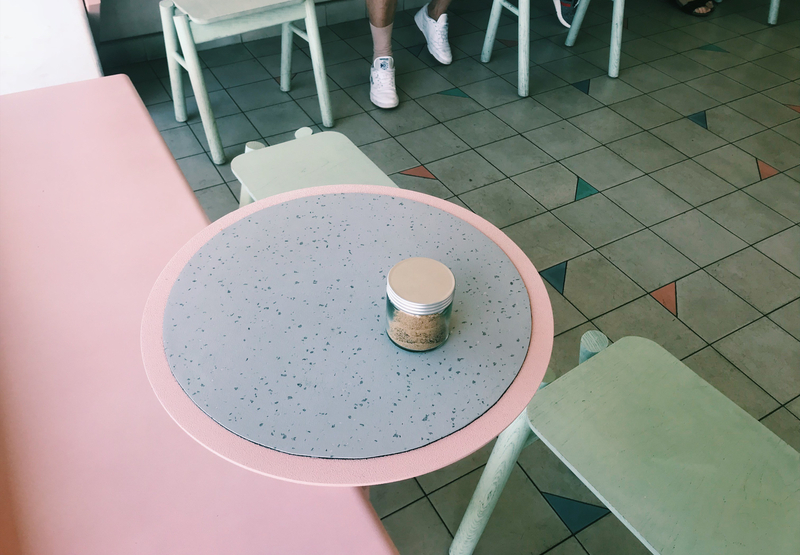 I’ve only just touched the surface of Melbourne’s coffee scene in this blog post but don’t worry, I’ve got plenty more time here to explore and copious amounts of coffee to drink. Keep a look out for my next post where I’ll be exploring the cafes in Melbourne’s inner city suburbs such as Cartlon, Fitzroy, South Melbourne and St Kilda. Any must visit cafe recommendations? As always, drop me a comment below.